While most geopolitical fears are focused on the Middle East, it would be wise to also keep an eye on the Far East. There are no less than five major territorial disputes agitating the area, two of which have heated up in recent weeks, and all of which present potential headaches for the United States. 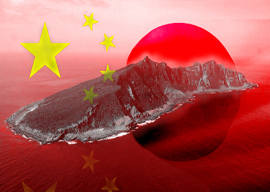 The first concerns the fabulous Senkaku Islands. Tiny and virtually uninhabitable, the little specks northeast of Taiwan are anchored in a large stretch of water believed to be rich in natural gas deposits. Contested over by Japan and both Chinas, the conflict was dormant until the United States surrendered control of the region to Japan in 1972. The Japanese government leased their claims to a private company, which they then forbade from developing the islands. But things have heated up since the emperor’s men recently bought those claims back. On the Chinese mainland, there has been rioting in major cities; Japan responded by closing down its factories there. The rhetoric is heated and the conflict is likely to escalate, despite the economic woes both sides will face. Japan is also at loggerheads with South Korea over another obscure group of islands, in this case the Liancourt Rocks in the Sea of Japan. Inhabited by two South Korean fishermen, in August the islands were treated to a visit by South Korean president Lee Myung-bak. In response, Japan withdrew her ambassador and attempted an appeal to the International Court of Justice, which Seoul torpedoed. There were the requisite riots and protests in both countries, and North Korea declared her support for her southern neighbor despite ideological differences. Japan is also feuding with Russia over the Southern Kurils. Japan maintains it did not surrender control after World War II as it did with the rest of the chain. After the Soviet Union fell, there was speculation that Russia might sell the disputed islands to Japan. Not only didn’t this happen, but in February of 2011, Moscow reinforced them. Internal political need in either country could always reignite tensions over these islands. Mercifully, Japan is not involved in conflicts over two other island groups that are thought to sit atop vast energy resources: the Paracel (both Chinas and Vietnam are feuding) and Spratly (those players plus the Philippines, Malaysia, and Brunei). One might well wonder why there is much jumping up and down over small bits of real estate with relatively little to justify the potential costs in wresting control of them. The reason, in a word, is identity. All the players have to prove to their peoples and themselves that they are not betraying their pasts.